Our clients here at the Affle AppStudioz often ask us to guide them through the available options to develop their apps. Here’s a walkthrough of the two technologies that are popular with clients and developers alike. With the advent of web apps and hybrid apps, HTML5 based app development has become a contender for the titles that only native app frameworks and game engines held before. 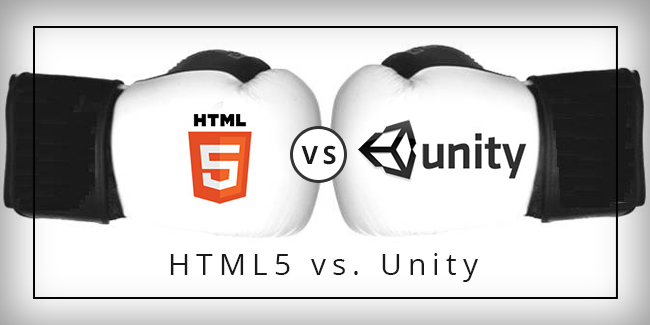 HTML5 and and Unity are the two technologies that are constantly pitted against each other because of their popularity in the mobile application world. Before we head for the knockout rounds, let’s first choose how to categorize the rounds. Here’s where you decide if you need a web app, a hybrid app or a native app. A great description of the different app types can be found in this Nielsen Norman Group article. Gaming Apps: These are preferably native apps with heavy animation graphics, motion events and sound effects. Non Gaming Apps: These could be native/ hybrid / web apps depending on the required features. For example if the native features like back camera or front camera are essential to the app then it should be built in native frameworks for a smoother experience. Once you have chosen the type of mobile app you need to build, this face off should help you understand what platform would give you optimum results. Competition between the most popular licensed game engines isn’t a new phenomenon when it comes to the mobility industry. Today, if you take a close look at two of the most powerful game frameworks like Unity3d and iOS Scenekit, it is quite evident that both are attempting to set a benchmark by offering the best tools for building games to the developers. But as a developer, how would you go about picking the best game engine for your project? Which framework is best for your project?